Before this month, my necklace storage solution was a bit of a disaster. Basically, I just hung them up all over the place. On bookshelves. My mirror. Door handles. I'd leave them in the soap dish in the bathroom. In cups near the sink. I'd essentially come home, take off my necklace, and then hang it in the first place I saw. This meant that, come time to get dressed, I'd end up wandering around the apartment trying to find the necklace I wanted to wear. A couple weeks ago, I decided to create an easy (and pretty!) solution to my necklace problem. First, I bought two packages of inexpensive cup hooks at Home Depot (they were about $2 for a pack of 25). Then I pulled out a quart of the paint I used in my bedroom (if possible, you should always get an extra quart for touch-ups and little projects like this one), and painted the hooks to match. You don't have to paint the hooks, but I like the way they disappear into the wall and just leave the necklaces as the focal point. I let these dry for 24 hours, and then took a ruler and marked dots about 1 1/2" apart on a portion of my wall next to my dresser. 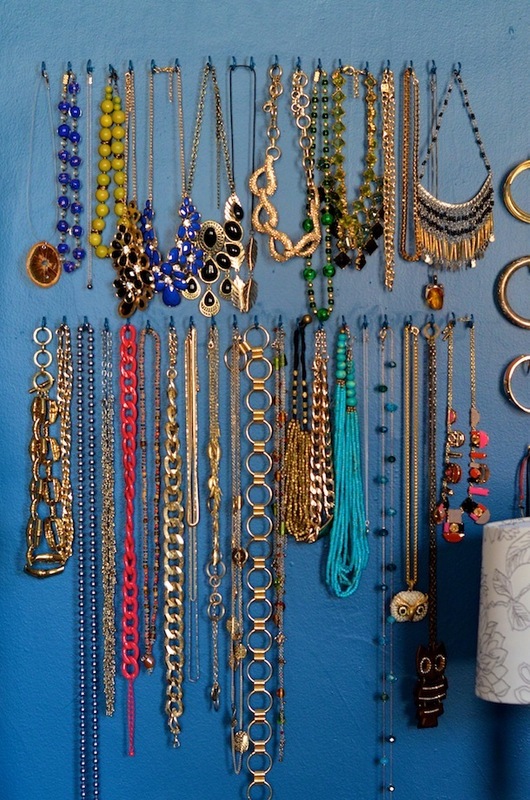 How many you make depends on the size of your space and how many necklaces you want to hang. I made another similar row with holes 2" apart about 14" above the first row. The plan was to put shorter, wider necklaces on top, and thinner longer necklaces on the bottom. Again...your distribution will depend on what kind of jewelry you have. I used a hammer and small nail to make "starter" holes in each dot, then screwed the cup hooks in. I love the way this looks--it's organized, but it's also like a work of art in itself. 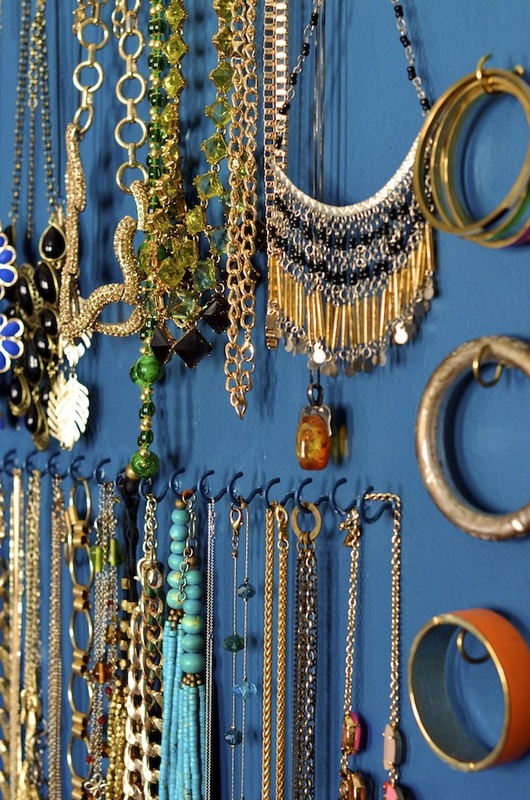 It makes getting ready a lot more fun, and makes it easy to keep track of my jewelry. P.S. You could also do this for belts!